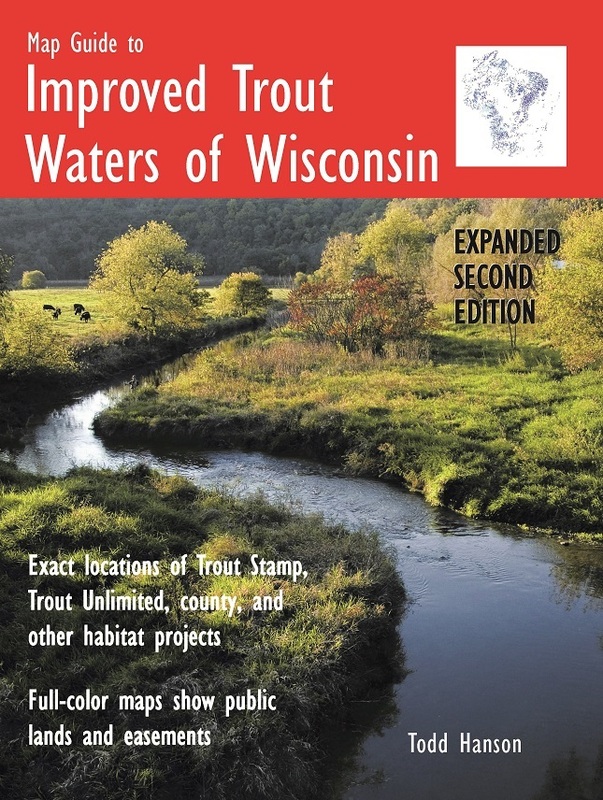 Whereamipubs.com - "Improved Trout Waters of Wisconsin"
"Improved Trout Waters of Wisconsin"
"Improved Trout Waters of Minnesota and Iowa"
of Wisconsin...now in its second expanded edition. Once a stream has been restored, it typically holds 40-60% more trout. You've paid for these hot spots with your trout stamp dollars...shouldn't you know where they are? Notice that the above map shows all of Gilbert Creek, not just the improved sites on the far left. Most maps in the book are like this, so you not only get a book showing improved sites, but a book that shows your other favorite fishing spots on most of Wisconsin's top trout streams. 128 pages of maps show the restored sections of about 300 trout streams. Red brackets enclose where stream improvement work has been done. Multiple improvement sites are listed by letter. Some habitat projects date back to before Wisconsin's trout stamp program began in 1978. Because the book is in color, we also show you where state-owned lands are located. WDNR-owned parcels are in green. County lands are shown in a lighter shade of green. IMPROVEMENTS: Find out what you can expect before stepping into the water. Half-logs? Wing dams? Lunker structures? They're all listed. YEAR: The year the work was done. FUNDING: See which government entity or organization did the improvement work. GPS: Finally, we've included the GPS coordinates of each site's midpoint. Lands under easement to the WDNR are shown in easy-to-see red. Easements given to Trout Unlimited, counties, and others are also listed. Sometimes easement lands are poorly marked. With this book, you'll know exactly where they are. Because our book is in color, we show the three classes of Wisconsin trout streams in different shades of blue. The sample above shows an improved site starting at the beginning of class II water with class I water above. You'll really like this...our book shows trout streams and feeders in greater detail than other books. 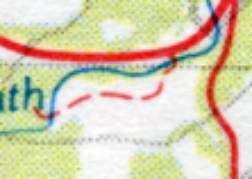 We've used more detailed GIS layers in making our book. Notice all the bends in the stream on our map...you won't find that in the Gazetteer. In our book you'll see important coldwater feeder streams that don't appear in the Gazetteer. The sample above shows three feeder streams that just don't show up in the Gazetteer. Finally, our maps are twice as large as those in the Gazetteer. The Gazetteer is in 1:150,000 scale. Our maps are in 1:75,000 scale. $34.50 Map Guide to Improved Trout Waters of WI, 2nd Ed. Where Am I Publications, Inc.
Or order on-line at Amazon.com. Select retailers in Wisconsin, Illinois, and Minnesota carry Map Guide to Improved Trout Waters of Wisconsin. Check the "retailer" page for a store near you. Copyright 2010 Where Am I Publications, Inc.